Supply of fitted kitchens and bedrooms. We are absolutely delighted with our new kitchen. Richard came up with an excellent design despite the constraints of the room. He had innovative solutions to problems and advised when asked, but never pushed us into things we didn't want. He was helpful and easy to work with throughout the process. The fitters and craftsmen all arrived when expected and carried out the work efficiently and tidily. Martin did an amazing job of fitting the kitchen. There were one or two minor glitches which were resolved with the minimum of fuss. We are so pleased with the quality of the goods and the design. We would happily recommend Holtams and in fact, have done so already! Holtams were helpful and pleasant to deal with. The work was started and finished on the agreed dates. The fitter consulted us as he undertook the work and we were delighted with the finished result. Complete service from planning through to completion was excellent. All tradesmen were polite and efficient. From removal of a wall, new ceiling, electrics, plumbing, gas, floor tiling, and the fitting all flowed smoothly from beginning to end and all work was to a high standard. I am very pleased with my new kitchen. Thank you. Excellent and professional service, Richard our kitchen designer came up with a great design and ideas for storage solutions that we had not even thought about. The quality of the kitchen we chose was much better than others we had seen from other kitchen companies. Overall we are very happy and could not recommend Holtams enough. *Customer Feedback* Issues, including non-compliant installation of a gas hob, left us very dissatisfied with Holtams. On the day our kitchen fit was due to begin sudden poor health prevented the assigned fitter being able to start, for some weeks, putting Holtams in a difficult situation not of their making. Holtams put in place a plan using their available trades people but the work of the replacement fitter was poor and incomplete and he was of poor demeanour. Issues with goods supplied added to stress. Holtams acknowledged complaints, brought in other fitters for corrective work but it took several visits, over 3 months. The greatest concern was our complaint regarding the quality of fit of gas hob, which was not addressed appropriately. Holtams were overly concerned with getting payment from us. We ended up assessing the installation ourselves alongside the fitting instructions; should the customer need to (could all customers) do this? It was very clear that instructions had not been complied with. Very different to our previous experience of kitchen fitting 20 years ago; supplied and fitted by MFI, correct and quality goods, perfect fit in 4 days, fitters did not need to return at all. *Traders reply* We've done everything possible to rectify the issues reported. Original installer was unable to start the job and we rescheduled other commitments to minimise the delay. The installer did leave issues that required attention and we've done our very best to deal with these and keep the customer informed. Only a couple weeks ago a new problem was reported, which is being taken care of. Quality of the initial installation was not to the standard we expect, several installers have since returned. Remedial work was done as quickly as possible and with minimum disruption to the customer. Payment mentioned was cost of the installation, this was not owed to us but was paid to the installers who returned after the initial fit. As a goodwill gesture the total was reduced in light of the problems. We also upgraded some items in the kitchen after the customer raised concerns over what they'd originally asked to be supplied. Our nominated plumber put the hob in place, it was then left to another party to connect and commission it. There was an issue with the hob not sitting flat and on the advice of a Neff service engineer, our plumber returned and re-fitted the hob. Customer was much happier with the fit after this second visit. Of course we'd rather these problems not have happened and caused the inconvenience it has. We've done our very best, with the resources available to us, to resolve all problems as quickly and efficiently as possible and we will continue to provide ongoing help and support as we do for all our customers. Holtams were excellent. Very attentive to detain and offered many alternatives during the design stage to reach my budget. Our fitter Alan was really good, reliable and clearly highly skilled. The quality of the granite is also outstanding. Overall we love our new kitchen. I cannot praise Holtams Kitchens enough, particularly Steve Hind who was brilliant and handled all our queries, and made sure we were kept up to date of all details, pricing, timings etc., and provided guidance of what he believed would work well in our space. All the workmen were professional and polite, any problems that arose were swiftly taken care of, so pleased with the quality of our new kitchen it looks fabulous. Would definitely recommend, thanks again Steve and team. From first walking into the showroom we were made welcome and not pushed or rushed into anything. The planning process was handled with great skill and patience by Greg who then project managed the whole process. The fitter Craig did a fantastic job, nothing was too much trouble and the level of workmanship was first class, I cannot praise him enough. On the whole a very pleasant experience with exceptional value for money and first class products. I would have no problem recommending this firm to anyone who wants a new kitchen. Very good service. No sales person trying to make you buy, but very helpful when you decided, came when you asked to do the fitting. Very good after care. Totally satisfied throughout. Great care shown by salesman Steve (e.g. disability fittings), fair and very competitive price. Excellent work by Alan the fitter. Would unreservedly recommend! Excellent company and service throughout the installation. Would thoroughly recommend Holtams Kitchens. 3 months after fitting and I've had no problems with the finished kitchen. Very friendly and professional staff. We went to Holtams for our new kitchen as we wanted to use a local company and from the moment we walked into the busy showroom without an appointment nothing was too much trouble for them. We went back and forth via email with Steve for a long time planning and designing our kitchen to not only get everything we wanted but to also get it within our budget, no small task . We did compare prices to the big DIY stores and Holtams were about 20% cheaper and the quality was much better. Once we were happy with the design and the price we were given an installation date and paid our deposit. The fitter turned up on exactly the date and time agreed and did an excellent job. The Corian worktop people Holtams sent out World of marble, Langor were also exceptional, really friendly, knowledgeable bunch of guys who took great pride in their work. I won't pretend there weren't a few teething problems during the install as no major project never runs completely smoothly but every issue was both gladly and promptly resolved by either Holtams or Jordan. It's a breath of fresh air when tradesman and companies are helpful even after they've got your money. Everything done well and on time. Excellent job on all rooms. Arrived when promised. Were flexible with all our other outgoing work. Fitter did an excellent job and was also willing to amend our requirements. Lovely people to deal with, very helpful at all times during the process. My kitchen is beautiful. The fitter was excellent, very professional and polite and his work was faultless. Very competent company from the discussions and help in planning in the show room to the fitters who came and installers. Very pleased with the result. We experience excellent service, both in the planning and execution of our new kitchen. The kitchen designer at Holtams ensured we were happy throughout the whole experience. We had our kitchen designed and fitted by Holtams Ltd. Richard was the designer and Neal did a fantastic job fitting it. I love my kitchen for a small kitchen I can't believe how much space we have now. It's so stylish too. I would highly recommend this company as nothing was too much trouble for them. Fantastic customer service by all. Would definitely recommend. I chose Holtams to fit my new kitchen on the strength of them being on the Trusted Trader website and reading the good comments that previous customers had left and I wasn't disappointed. From the initial meeting with the designer, Richard Newton, to the final day of fitting everything went smoothly. All the tradesman were professional, friendly, polite and punctual and the workmanship was of a high standard. 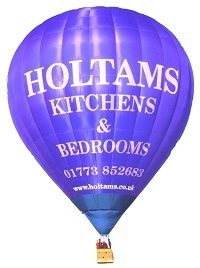 I am very pleased with my new kitchen and would not hesitate in recommending Holtams. Very pleased with the new kitchen & appliances. Installers were extremely professional & courteous. Would recommend the company without reservation.